machine learning for magnetic resonance signal processing. The work strives towards transforming the descriptive interpretation of biomedical images into a model-driven analysis that infers properties of the underlying disease process by using statistical, physiological, and biophysical models. A related effort is the application of such models to big clinical data bases in order to learn about correlations between model features and disease patterns at a population scale. In this, the current focus is on applications in clinical neuroimaging and oncological staging. 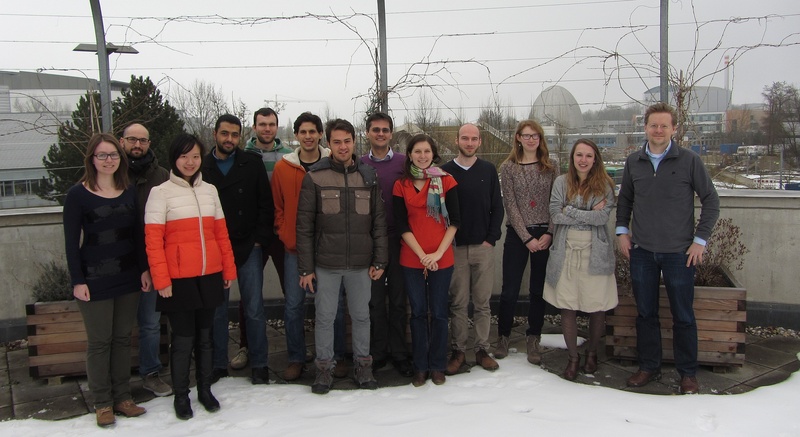 IBBM group in February 2018 (Please find Jana and Lina in the last picture). Group picture in February 2015 here. For open MSc/BSc/IDP projects in the IBBM group, please see here or contact any member of the group directly. For applications at Ph.D. or postdoctoral level please refer to this page (and mention "IBBM application" in the comments section). We are located at the Munich School of Bioengineering / IMETUM which is on the Garching Campus (see the map) in between the Informatik/Mathematik building and the Maschinenwesen building.